'Abide With Me' is waiting to be sung, the trophy engraver is ready to etch and a quarduple is still there for the taking. The tension is almost unbearable, as the historic FA Cup comes to a climax with the Final at Wembley. It's Man City vs Watford, and you can get an FA Cup final live stream wherever you are. The FA Cup final between Man City and Watford will take place at football's spiritual home - Wembley Stadium in London. The game itself kicks off on Saturday May 18 at 5pm BST (12pm ET, 9am PT in the US, and 2am in Australia in the early hours of Sunday morning). No matter how big a Hornet's fan you are, there's no denying that Man City are overwhelming favourites for this game. A quick look at their team-sheet (and how much the club has spent on players) should tell you everything you have to know. Aguero. Kompany. De Bruyne. Sterling. Sane. Silva squared. And with Pep Guardiola calling the shots from the bench, there aren't many games that the blue side of Manchester go into as second favourites. But then with a tough Premier League title race and talk of quadruples being bandied around, will this be the moment they let their guards slip. It's Watford's first FA Cup Final appearance since 1984 and they will likely lean on influential leader and club captain Troy Deeney who will lead the line and set the tone and tempo for his team mates. With flair players Maxi Pereyra and semi-final hero Gerard Deulofeu, Watford have the creativity and skill in midfield to trouble the Wolves defense, but they certainly won't have it all their own way. You can watch the players try to carve out their little piece of history by getting a live stream of all the FA Cup final action from wherever on Earth you are. 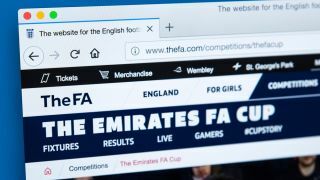 Below we're going to talk you through the best ways to watch the FA Cup final in the UK and the rest of the world so you can ensure you can easily live stream one of the biggest matches in the footballing calendar. The BBC will be hosting the FA Cup final on Saturday May 18. It'll be on BBC One - naturally - with the kick-off ready for 5pm. You'll be able to watch it live on TV, through the BBC iPlayer app or online with the iPlayer live stream. You'll have to pay for a TV license if you want to watch this in the UK though. There's also the BBC Sport website that will be live streaming the whole game in a similar way to the BBC One coverage too. The alternative is to watch the game on TVPlayer.com, which is a robust, high-quality streaming site that's absolutely free and has all your favourite Freeview channels in one place. In the US? Then keep scrolling, as we have your viewing options below...spoiler alert, you'll need an ESPN+ subscription. And footy fans Down Under can also see who's broadcasting there. But if you're abroad for the game and find that you can't watch your home coverage online because it is geo-blocked, we have a handy alternative to allow you to watch as if you were back on your sofa. The only legal alternative we know of is to download and install a Virtual Private Network (or VPN). The software allows you to change your IP address to a server in another country so that you can watch online as if you were there. What's more, using a VPN also makes you more secure online, as your activity will be encrypted. We've tested and reviewed more than 100 providers to see which one to recommend and we rate ExpressVPN as the absolute best. It's fast, secure and compatible on loads of different devices (Amazon Fire TV Stick, Apple TV, Xbox, PS4, etc). It heads up our top 3 picks (see below) and it even comes with a 30-day money back guarantee so that you you can try before you buy. Once you're up and running with your chosen provider, you then simply need to open the app and select the appropriate location - it's super easy to do. Having launched in 2018, online subscription service ESPN+ is now picking up more and more momentum - along with a greater range of sports. And now's it's managed to snag FA Cup football, too. It only costs $4.99 per month and allows you to watch online as well as via its mobile app and TV streamer apps on the likes of Apple TV, Amazon Fire TV, Roku, PS4 and Xbox. But the best news is that you can grab a seven-day FREE trial. So if you haven't used ESPN+ before, you can sign up for that and get a taster of its sports coverage without paying a thing. In Australia you have a selection of choices too with ESPN being the main host for the FA Cup final. You can watch live on that channel with your TV, or you can stream it online as well. You'll also be able to watch it through both SBS and SBS Live, plus there's an app so you can stream it for free in Australia. We don't think this will work in other countries though, so don't use this route if you don't live in Australia (unless you want to use a VPN to do so). You'll be able to download The World Game app that's produced by SBS and will show the game for free on either iOS or Android devices. You could also choose Kayo Sports. The Kayo Sports Basic Package costs $25 per month and allows users to stream across two devices simultaneously. Alternatively, the service also offers a Kayo Sports Premium Package, which provides three concurrent streams for $35 per month. As far as we can tell, there will be no official broadcast of Watford vs Man City in Canada, and certainly no free stream. That means you're limited to watch the match using a VPN. It let's you watch everything for free from the comfort of your own home or elsewhere on a tablet or phone - just follow our easy three steps above.